Pick-ups will begin approximately 6:00 AM. Are food and beverages included in the Grand Canyon bus tour? On our Grand Canyon South Rim tour, a light breakfast snack and a delicious deli lunch are included. The water it’s on us. All you can drink! There are big changes in weather when going to the Grand Canyon from Las Vegas. Dressing in layers is suggested year round as summer monsoon storms are common. For the winter months, dress in warm clothing. Remember to wear sunblock and hats for protection. We do not charge a fuel surcharge, and there are no other charges on the day of your Grand Canyon South Rim bus tour. Our bus tours of Grand Canyon from Las Vegas are unmatched in service, comfort, and entertainment. 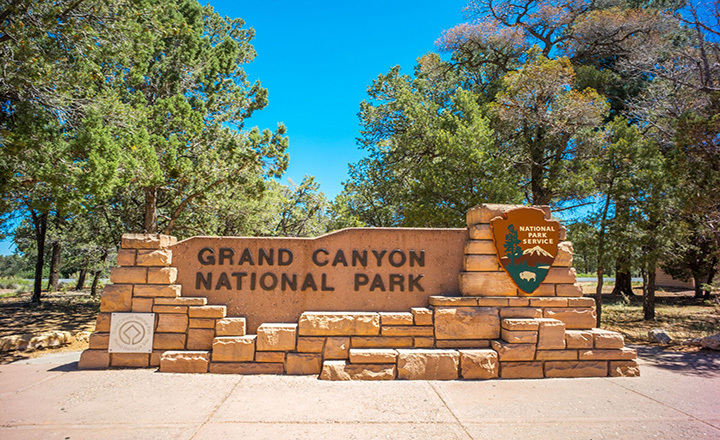 Due to the longer drive to this destination, the best Grand Canyon South Rim tours from Las Vegas will not waste any time. Because of this, your day trip from Las Vegas begins with a convenient hotel pick-up in our luxurious fleet. 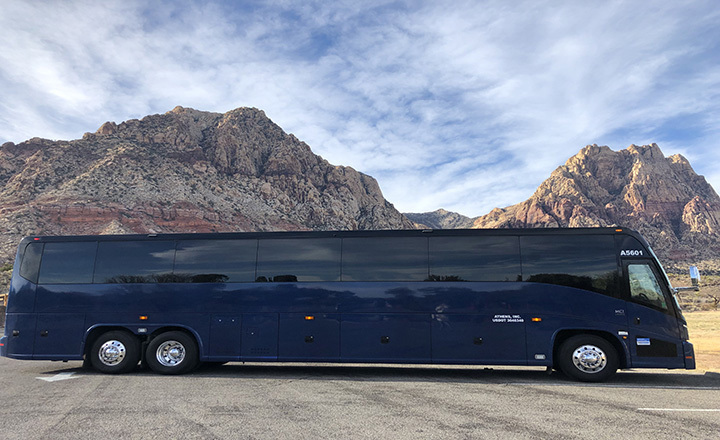 Traveling on our Las Vegas to Grand Canyon tour bus, you will be given complimentary food, amenities, and entertainment that will make your trip that much more enjoyable. Our buses are all state-of-the-art model vehicles with adjustable seating, individually controlled air conditioning, and panoramic windows. There is also a unisex lavatory aboard with a hand washing station for customer convenience. Taking a Grand Canyon South Rim bus tour from Las Vegas is the perfect way to experience the Grand Canyon in a day trip without breaking the bank. Our Grand Canyon tours from Las Vegas to the South Rim run from approximately 6:00 AM to 9:30 PM. To start the morning, we offer you a delicious snack for breakfast to enjoy along the way. Our experienced staff will guide you to all picture taking opportunities as travelers set out to embark on the man-made wonder for the first stop of the day, the gigantic Hoover Dam. Most Grand Canyon bus trips skip the Hoover Dam, but not us. It’s a true postcard moment when you can take stunning photos of the Hoover Dam and Colorado River. The excitement doesn’t stop there! Along your Grand Canyon tour we’ll visit other recognizable sites, like the iconic Route 66 that includes a gift shop and a comfort stop in Seligman, Arizona. A blast from the past brings travelers up close and personal to famous signs and vintage cars from the 40’s and 50’s. Our Grand Canyon tours South Rim view features two iconic sites at the National Park: Mather Point and Bright Angel Lodge. Walk along the paved road between the two points and enjoy the absolutely breathtaking views. We want you to have the Grand Canyon experience you have always wanted. For that reason, we offer different options on all our tours so that you can customize your adventure. 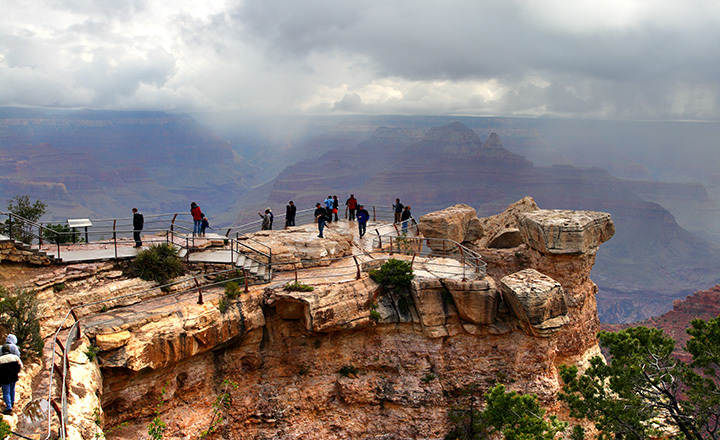 Our Grand Canyon South Rim bus tour with optional upgrades include Grand Canyon walking tours. To experience this, choose the Grand Canyon bus tour with walking tour guide option when checking out. Our trained tour guide will walk with you and personally show you all of the best spots for photos along the way all while displaying their impressive knowledge of the Grand Canyon National Park. Traveling back, the Grand Canyon to Las Vegas bus ride is a breeze as you relax and leave the driving to your dedicated driver and guide. On the way back from the Grand Canyon to Las Vegas relax in comfort with a stop in Kingman, Arizona. Here, West-Coast foodies and burger lovers at heart can savor the famous California-based In-N-Out Burger for one of their famous burgers (vegetarian stop option also available). With the Las Vegas twinkling lights in the distance and a loved one to share it with, we assure you it will be the highlight of your trip to Las Vegas! Take the Grand Canyon Tour of a lifetime today. Stop thinking. Start planning your trip to the Grand Canyon South Rim and be sure to choose Grand Canyon Destinations! We offer more Grand Canyon visitor bus tours from Las Vegas than anybody else. Don’t forget to Tweet about this tour and tag us on your Instagram posts. We love videos too!.